The RSPCA is appealing for information about a small bay pony found abandoned in large crop field in Essex on Wednesday 20th April. A member of the public spotted the emaciated pony, who is thought to be just a year old, roaming alone around the enormous field near Matching Road, in Hatfield Heath. They immediately called the RSPCA for help. Nicknamed ‘The Littlest Hobo’ by RSPCA officers, the 10hh filly is now thankfully in veterinary care, although not before giving the rescue team the run around. 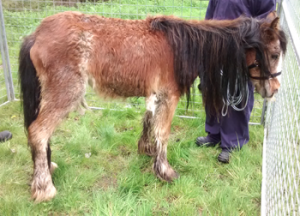 RSPCA inspector Kate Fletcher said: “We received a call about this little pony and although when we attended we could clearly see she was in a bad way, she she certainly wasn’t going to come quietly. “Just as we got near her each time, she would move off again – she was clearly enjoying the chance to have some grass. Despite my best efforts with an officer from Redwings Horse Sanctuary, we did have to use a dart in the end and then use a pen to catch her. Though she didn’t want to be caught she obviously couldn’t stay where she was and was in desperate need of care – the vets gave her a body score of 0.5 out of 5. Some of the world’s most esteemed riders will take part in the National Dressage Grand Prix Freestyle invitational competition at Royal Windsor Horse Show 2016 where they will perform their routines on Wednesday 11th May. For many of the riders, this highly-anticipated exhibition will be the last chance to polish off their choreography in front of a live audience ahead of the summer Olympic Games in Rio. All eyes will be on Olympic favourite and reigning world champion, Charlotte Dujardin, who will be returning to the iconic Castle Arena, riding the stunning chestnut gelding, Barolo. Charlotte’s last appearance at Royal Windsor Horse Show was in 2014, when she put on a victorious performance aboard Carl Hester’s London 2012 Olympic gold medallist, Uthopia. Charlotte will have stiff competition in what is shaping up to be a stellar class. One of the biggest challengers will be reigning Royal Windsor Horse Show champion and fellow Team GB rider, Carl Hester riding the world-class Nip Tuck, a combination looking to repeat last year’s triumphant performance which saw them score an impressive 75.38%. Michael Eilberg, part of the silver medal winning 2015 European Championship team with Charlotte and Carl, will be adding to the excitement around this Grand Prix Freestyle event, along with others pushing hard to impress the Team GB selectors ahead of Rio, such as Olympic gold medallist Laura Tomlinson, Pippa Hutton, Spencer Wilton, Hayley Waston-Greaves and Ryan Todd. General entry to Royal Windsor Horse Show will be free of charge on Wednesday 11th May, however due to popular demand, reserved seats to watch this unmissable class are available to buy in advance and are expected to sell-out fast. Tickets are on sale now and can be purchased on www.rwhs.co.uk or via the box office on 0844 581 4960 from the UK and +44 (0) 121 796 6290 internationally. Held at Easton Farm Park, Suffolk, the annual SYF Country Fair with Horse and Dog Show will be taking place on Sunday 17th April from 10am. 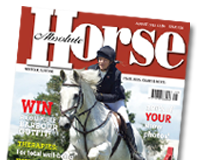 Horse classes include Showing, Show Jumping and Fun classes, and dog show classes include Affiliated and Unaffiliated – all levels welcome across the board. All schedules are available on www.suffolkyfc.com or call Rebecca Smith on 07900 988907.